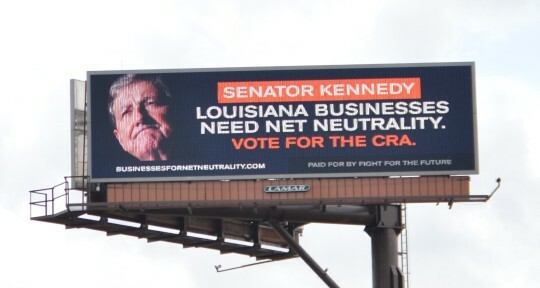 Net neutrality supporters also crowdfunded to put up billboards in key states like Colorado, Louisiana, and Ohio as well as full page newspaper ads in Alaska and Maine highlighting the concerns of the thousands of small business owners signing the open letter. 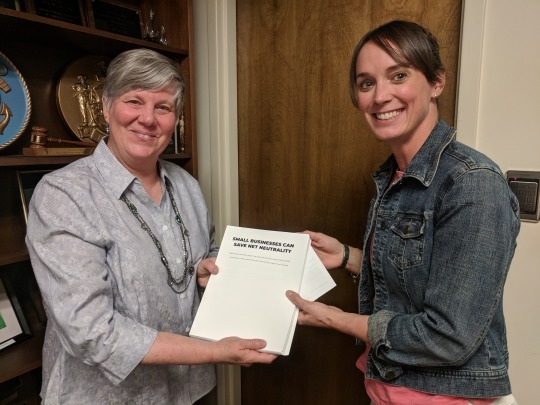 To date, nearly 6,000 businesses have signed the letter, including veterinary offices, graphic design shops, restaurants, medical startups, music venues, attorneys, tutoring services, chiropractors, engineering firms, and an amusement park machine supplier. Businesses are being listed publicly on the letter in a rolling fashion as they are verified. The nationwide push is supported by a range of groups representing startups and small businesses including the American Sustainable Business Council, Etsy, Patreon, Engine Advocacy, Main Street Alliance, Good Business Colorado, and Small Business Majority, along with groups like Fight for the Future, Demand Progress, and Color of Change. A staffer for Senator Susan Collins accepts the letter from business owners who came to thank her for supporting the CRA. “Our small Alaska-based technology business depends on affordable access to an open, neutral Internet to deliver training, software updates and data to customers around the state,“ said Julie Olsen, President of OfficeTECH, Inc. in Anchorage, AK. 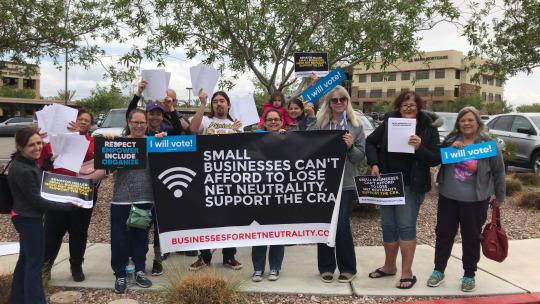 “We need lawmakers to just say “NO” to deep pocketed ISPs plans for fast lanes online and, instead, vote to protect Alaskan businesses and their employees by supporting the CRA resolution to overturn the FCC’s repeal and put strong net neutrality protections back in place.